Physics and Chemistry of Surface . Book I. / Eds. М.Т. Kartel, V.V. Lobanov. Enterosorbents: drugs and dietary supplements (scientific and reference edition). – Kyiv: NAS of Ukraine, Chuiko Institute of Surface Chemistry, 2014. – 248 p.
In the first section of this book theoretical evidences of adsorption phenomenon are provided, physicochemical basis of therapeutic action of enterosorbents and questions related to pharmaceutical analysis of sorbents are considered. The special second part reviews the certificated medical enterosorbents and dietary supplements that are present in the pharmaceutical market of Ukraine, as well as some foreign products. The sources for annotations for each of the medicaments were the official documents of the Ministry of Public Health of Ukraine, scientific monographs, periodicals and online resources. This reference edition is intended for pharmacists and physicians that aim for the scientifically grounded administration of enterosorbents. The book can be interesting for chemists who are specialists in the area of the adsorption phenomena. Useful information will be found by individuals seeking to improve own health by the use of dietary supplements. This book describes the applications of important new NMR spectroscopic methods to a variety of useful materials and compares them with results from other techniques such as adsorption, differential scanning calorimetry, thermally stimulated depolarization current, dielectric relaxation spectroscopy, infrared spectroscopy, optical microscopy, and small-angle and wide-angle x-ray scattering. The text explores the application of NMR spectroscopy to examine interfacial phenomena in objects of increasing complexity, beginning with unmodified and modified silica materials. It then describes properties of various mixed oxides with comparison to individual oxides and also describes carbon materials such as graphite and carbon nanotubes. № Е 12/13-090). - Kyiv: NTTU (KPI), 2013. - 480 p.
Biology, Ecology / Eds. А.P. Schpak, V.F. Chekhun. In this monograph the actual problems of physico-chemistry of nanomaterials, nanocomposites and supramolecular structures intended for application in medicine, biology and ecology are considered. The investigation of nanocomposites based on silica and magnetite, sorption materials, the mixture for protection and stimulation of plants in the initial period of growth, the structure for application in “electromagnetic” ecology, investigation of the influence of low intensity electromagnetic irradiation (millimeter-scale) on the biological systems of different organization levels and etc is presented. The formation processes of fumed nanostructured oxides in the industrial production are analyzed. It is discussed the diagnostic method of eye applying innovation technology of IR-transillumination of biosystems. This book is appointed for specialists in the branches of nanochemistry, nanophysics, material science, surface chemistry and physics who have deal with the synthesis of new nanostructured functional materials and their practical application, high school teachers, PhD-students and students of the corresponding specialities. Main chapters of physical chemistry, namely chemical thermodynamics and equilibrium, solution theory, phase equilibrium, transport phenomena, chemical kinetics and catalysis, surface phenomena and adsorption, electrochemistry, chemistry of high energy are stated in the textbook. Definition of the basic concepts of physical chemistry of nanosystems is presented. The textbook contains the detailed description of laboratory works from the classical directions of physical chemistry as well as a numerous amount of tasks and exercises classified by the topics of the corresponding lectures. The textbook is intended for the students of chemical faculties of universities, chemicotechnological, biological and medical high education institutions, PhD students, scientific and technical employees, lecturers of physical chemistry. The textbook is devoted to implementation of novel scientific research results in the field of the nanotechnology, obtained in NAS of Ukraine, to the educational program of the institutions of higher education Actual modern ways of biofunctionalized nanocomposites synthesis and application in the field of medicine, biology and biotechnology have been enlightened in the textbook. Scientific data and practical research guidance may be used in carrying out educational programs of certain specialties. Theoretical elucidation and the description of basic practical creation stages for multifunctional magnetosensitive nanocomposites with functions of biomedical nanorobots is devoted to new skills obtaining in the field of nanotechnology. For students, postgraduate students, lecturers and specialists in the field of chemistry, biology and related technological and medical specializations. The investigation of cluster state of water in heterogeneous systems formed by solid and liquid phases in freezed solutions with solid-liquid interface in meso- and microporous solids, oxide nanoparticle aggregates or between structural elements of biomolecules and organelles in cell objects is informed. The main results are obtained by low-temperature 'Н NMR-spectroscopy, NMR cryoporometry, thermal analysis, adsorption, and IR-spectroscopy. Self-organization effects of aqueous-organic systems in the limited space of interconnected pores of the different sizes or emptinesses between the elements of dehydrated biopolymeric, protein and cell structures are detailed studied. The studied effects are taken into consideration during the development of principles of adsorption capacity enhancement of accumulators of combustible gases, the creation of new means for directed transportation of medical drugs and selective adsorbents, namely the carriers of medicinal substances, promoters of cellular metabolism activity and composites - the analogues of natural bone tissue. 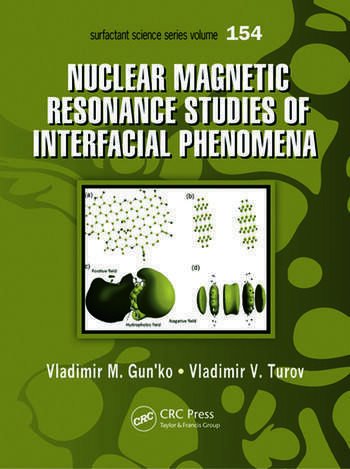 The book is recommended for scientific researchers, PhD-students and students who are interested in the study of interface phenomena. L.А. Bulavin, L.G. Grechko, L.B. Lerman, А.V. Chalyi. center «Kyiv University», 2011. - 478 p.
The dynamic systems are considered and the non-linear oscillator with quadratic and cubic nonlinearities are investigated. The solutions of non-linear differential questions are described as well as the corresponding theorems are formulated. It is stated the elements of qualitative theory of differential equations, classification of singular points and the stability concept with corresponding theorems. Elements of the qualitative theory of differential equations are lied out; a classification of singular points is provided; the concept of resistance of the corresponding theorems is introduced. Limited cycles and important phenomena as bifurcation are considered. Autovibrations in non-linear dynamic systems, synchronization, and chaos origin are investigated. Mathematical models that have to be understood as the system of non-linear differential equations corresponded to the certain processes and widely used in biology and medicine are studied. It is demonstrated the principles of mathematical models construction in biology, biophysics and medicine as well as the scopes of their application. The textbook is appointed for the PhD students and researchers who start the professional activities from the study of medical physics and everybody who are interested in a modern way of above-mentioned problems. Monograph contains the original results of analytical developments and own experimental investigation of medical-biological effects of nanoparticles. Great experience in the investigation of influence of technogenic pollutants in small dozes of low intensity on human organism as a result of Chernobyl catastrophe is widely used for interpretation of scientific facts. The book is addressed to wide audience of researches as medical doctors, biologists, pharmacologists, and chemists. V.М. Gun'ko, V.V. Turov, P.P. Gorbyk. In this monograph features of the behavior of water at different interfaces over a wide temperature range are systematized on the basis of investigations of oxide, carbon, polymeric and hybrid adsorbents, biomaterials, biomacromolecules, cells, microorganisms, tissues, seeds and others using; spectral (NMR, FTIR, UV/vis, XRD), relaxational (thermostimulated depolarization current, di electric relaxation spectroscopy), adsorptions (adsorption of low-molecular compounds, polymers biomacromolecules), desorption (thermo-programmed desorption MS and TG/DTA), correlation (photon-correlation spectroscopy, electrophoresis), quantum-chemical and other methods. To the wide circle of readers: researchers students and graduate students, interested in the interfacial phenomena. /Eds. Plinio Innocenzi, Yuriy L. Zub, Vadim G. Kessler. - Dordrecht: Springer, 2008. - 505 р. The collection includes scientific papers on a wide circle of the problems on physico-chemistry of nanosystems and supramolecular structures. A particular attention is paid to examination of the peculiarities of interaction of the medico-biological nanocomposites based on silica and/or magnetite with the components of biological media; to the processes of self-organizing of the water-organic systems within nanoscaled space of the porous structure of solids; to the optimization of conditions of biopolymers immobilization and antioxidants without loosing their native properties on nanostructure surfaces. The techniques are described of chemical functionalizing nanomaterials, in particular mesoporous siliceous nanostructural films. The problems are discussed on synthesis and examinations of the physico-chemical properties of photoactive structures with developed surface, nanotubes, and carbonaceous nanostructural materials. The results are summarized of investigations in the fields of the chemistry of supramolecular structures containing biomolecules on silica surfaces. An attention is paid to the problems of theoretical modeling of the surface structures and various physico-chemical processes on the surfaces with use of the analytical approaches and computational methods. The book is intended for the specialists experienced in the fields of nanochemistry, nanophysics, surface chemistry and physics, synthesis of new nanostructural functional materials and their practical application. It proves useful to students, post-graduate students, and high school teachers. This course deals with the theory of chemical bonding in molecules, solids and the theoretical aspects of adsorption on solid surfaces. Different descriptions of molecular interactions are considered in detail. This book is intended for a wide range of readers - chemists, physicists, professors, graduate students and undergraduate students studying or interested in quantum chemistry or solid surface adsorption. It can be used as a primer for courses such as Chemical Bonding and the Structure of Molecules, The Chemistry of Solids, and The Theory of Adsorption Processes. Dordrecht: Springer, 2006. - 444 р.
A.A. Chuiko, Yu. I. Gorlov, V.V. Lobanov. /Ed. P.P. Gorbyk. - Kyiv: Naukova Dumka, 2006. Main results of scientific inheritance of A.A. Chuiko in the branch of surface chemistry of dispersive silica and a great literature review of this matter are summarized. The structure and properties of crystalline and amorphous phases, the fundamental synthesis methods of wide-spread dispersive forms, surface structure, hydroxylic and hydrated layer, the nature of adsorption centers, the mechanisms of polar molecules adsorption and chemisorption, the reactions of chemical modification of silica surface are considered in detail. On the base of approaches developed by authors concerning the elementary transformation in oxide surface layer, a large amount of experimental results are analyzed, cordant explanation of the chemical reactions regularities on the silica surface and their interpretations are described. It is recommended for students, PhD-students, high school teachers, scientists, engineers and technologists who have deal with chemistry, physics and technology of solid surface, adsorption, heterogeneous catalysis and chromatography. Yu.N. Kozyrev, M.Yu. Rubezhanska, A.A. Chuiko. The synthesis and investigation of heterostructures with quantum dots Ge on Sі(100) and Si(111) substrates obtained by the molecular beam epitaxy method are considered. The technological peculiarities of epitaxial growth and the investigation of Si1-хGех monolayer structure by energy electron diffraction are reported. It is shown that the use of intermediate Si1-хGех layers allows regulating the sizes and density distribution of quantum dots on the substrate surface. It is appointed for the researches of nanophysics, nanoelectronics, physical chemistry of surface and condensed state as well as for Phd-students and students. / Ed. A.A. Chuiko. - Kyiv: Naukova Dumka, 2003. The monograph is the first generalizations of fundamental physico-chemical and biomedical studies of highly disperse silica adsorption interactions with bioactive molecules, biopolymers, biomembranes, cells, microorganisms, and viruses. The scientific principles and spheres of clinical application of silica as individual and composited medicines of detoxification, antimicrobial, hemostatic and antiatherosclerotic actions are reported. It is described the properties and structure of reactive centers of SіO2 surface that are responsible for peculiar interaction with bioobjects. Methods of surface modification in the aim of selectivity increase of adsorption interactions are characterized. The main regularities of alterations in thermodynamic and kinetic characteristics of adsorption are analyzed. The reasons of pharmacological action of drug and its dose are proved. Technologies of treatment of toxic infectious diseases, purulent inflammatory processes, diseases of the cardiovascular system, pathologies of different nature are outlined in detail. It is assigned to physicochemists, biochemists, pharmacologists, physicians who have deal with the forming and application of new drugs of efferent therapy. P.P. Gorbyk, A.A. Chuiko, M.V. Bakuntseva. Phase Transitions / ISC of NAS of Ukraine. It is summarized the results of fundamental and applied researches towards creation of a wide class of materials with dynamically controllable by external influences of electrophysical characteristics on the examples of the systems with developed surface and phase transitions conductor - high-temperature superconductors, semiconductor – metal, insulator – superionic. The monograph was published with the assistance of the State Fund for Fundamental Research of Ukraine (project 04.07/00035). It is recommended for scientific, engineering staff, high school teachers, PhD-students, and students who are specialized in physics, chemistry, and technology surface, physical and chemical materials science. Co. Pte. Ltd, 2002. - 205 р. / Ed. A.A. Chuiko - Kyiv: UkrISTEI, 2001. - V.1, Part 2. - 500 p.
The results of experimental and theoretical studies of surface chemistry of monocrystalline and dispersive oxides based on silica are summarized in the monograph. Synthesis of individual and aluminum, titanium, iron, and chromium doped silica and methods of their modification are described. Original principles of properties characterizations of effective and highly selective sorbents are reported. Self agreed quantum chemical model of silica surface that allows predicting the structure of primary adsorption complexes, estimate energy of molecule transformation onto solid surface and determine the properties of formed surface compounds is presented. The examples of new materials application in the different fields of industry, techniques, science, pharmacology and medicine are shown. The book is useful for students, PhD-students, lecturers, scientific researchers, technology engineers who are engaged in surface chemistry, adsorption, catalysis, and interface phenomena. Surface of Solid Oxides. - Kyiv: VЕК+, 1999. The monograph is devoted to elucidation of influence of exterior electrical and electrostatic fields of ion crystal surface layer on the structure of adsorption complexes as well as the investigation of their role in physicochemical processes at solid-gas interface. It is shown that accounting of distribution of near-surface electrostatic field allows predicting the structure of primary adsorption complexes, estimate the energy of molecule transformation onto solid surface and determine the properties of formed surface compounds. Theoretical methods used in the consideration of electronic structure of solid oxide surfaces and the results of their application in the study of electrostatic aspects of adsorption on the surface of dispersive silica and zeolites are described. Elsevier, 1996. – V.99. – 926 p.
B.M. Voronin, G.P. Prykhod’ko, S.A. Kirillov. Comparably new class of flaky compounds formed in metal-phosphorous-chalcogen systems is reported in the monograph. The synthesis methods, structure, physical and chemical properties are stated. The features of chemical and electrochemical intercalation of these compounds by various ions and molecules are given essential attention. The practical application of intercalated compounds, especially during creation of new chemical current sources is discussed. It is recommended for scientists, who are interested in chemistry and physics of solids as well as the transformation of energy accumulation. Extensive literature data and the results of own investigations in the field of surface chemistry of dispersive silica are summarized in the monograph. The structure of SiO2 surface layer, topography of its hydroxylic cover and nature of active centers are considered. The analysis of electron structure of surface fragments and adsorption complexes of polar molecules, energy of complex formation, and the study of elementary acts of surface processes on molecular level are given essential attention. The structure of hydrated layer, the mechanisms of adsorption interactions, re- and dehydration, elementary chemical transformations in silica surface layer are analyzed. It is recommended for scientists, engineers, students and Ph-D students who have deal with solid surface chemistry, adsorption and catalysis. V.M. Оgenko, V.M. Rozenbaum, A.A. Chuiko. The monograph is devoted to the systematic presentation of the theory of oscilations and reorientation of atom groups adsorbed on the surface or included in the structure of solid surface containing foreign atoms. Vibrational and orientational states of the above-mentioned objects in the power field of the substrate taking into account the interaction with phonons of the substrate and dipole interaction between polar groups of atoms are investigated. Theory of orientation phase transitions and exiton excitations in ordered and disordered dimensional dipole systems is considered. Theoretical methods of ground states study of interacting dipoles with rotational degree of freedom and vibrational spectra of multiparticle systems characterized by spatial and orientational disorder of the elements are discussed in detail. It is recommended for researchers in solid state physics and chemical physics; chemists who study the chemically active surface sites; students. V.A. Tertykh and L.A. Belyakova. The modern investigations of regularities and mechanism of chemical reactions onto surface of disperse silica are reported. The peculiarities of chemisorption processes depending on the state of hydrate cover, nature of active sites, electronic and geometric structure of modifiers are analyzed. The perspective ways of synthesis and physico-chemical properties of main classes of functional organosilicas are discussed. The book is recommended for researchers and technologists in the fields of surface chemistry, adsorption, catalysis, chromatographic methods of analysis, spectroscopy of surface phenomena. I.G. Chernysh, I.Е. Karpov, G.P. Prykhod’ko, V.М. Shai. The synthesis methods of donor and acceptor intercalation compounds of graphite, ionic compounds of graphite, the synthesis methods of thermographenite, characteristics study of their physico-chemical properties are considered. Comparison of the mechanisms and kinetics of the gas, liquid as well as electrochemical intercalation of graphite and physicochemical compounds of intercalated graphite and thermographenite is carried out. The data of IR-spectroscopy, Raman spectroscopy, impedance spectroscopy, cyclic voltametry, and charging curves are provided. The investigation results of chemical, XRD, electrophysical, optical magnetic properties of graphite compounds are analyzed. The examples of graphite application in energy conversion as the new catalysts for synthesis of multifunctional compounds are considered. It is recommended for researchers working in the fields of physics and chemistry of surface, electrochemistry, physical chemistry and materials science.